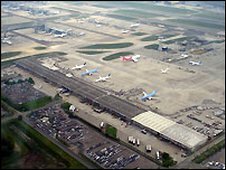 Campaigners against the expansion of Gatwick airport are objecting to plans to extend its North Terminal and build a multi-storey car park. Gatwick has submitted two applications to Crawley council for developments which will allow it to handle an extra five million passengers a year by 2018. Objectors say the plans will increase noise, pollution, traffic and create water shortages. Gatwick said environmental impact had to be balanced with economic benefits. It added that expansion up to 2018 was in line with government policy, published in the 2003 White Paper, The Future of Air Transport. The North Terminal extension would provide extra baggage reclaim halls and new check-in facilities and the car park 900 short-stay spaces. The airport has an agreement with West Sussex County Council not to build a second runway before 2019. But East Surrey MP Peter Ainsworth, whose constituency borders the airport, has objected to the planning applications. "There is a widely held view that every application for the expansion at BAA's airports - although billed by the company as the final demand - is in fact just part of an incremental process of unsustainable growth," he said. "Similar suspicion hangs over the present applications." He said the applications were premature, bearing in mind the airport is up for sale. Surrey branch of the Campaign to Protect Rural England says the new owners are quite likely to have different ideas on how they want to run the airport. Gatwick Area Conservation Group agrees the application is premature because the aviation industry is suffering from a "severe recession". And it says: "The proposed increase in the size of Gatwick is likely to give rise to national controversy, especially in relation to climate change." The applications are due to be considered by the Crawley's development control committee on Monday, but a decision is not expected before 10 November. A spokesman for the airport said: "Gatwick's planning application for North Terminal forms part of the airport's capital investment programme which will see £1bn invested over five years. "To remain successful the significant economic and social benefits of Gatwick Airport need to be balanced with the environmental impact of the airport. "London Gatwick Airport remains committed to sustainable and balanced growth and recognises the affect the airport has on its neighbours."